Prepare a template on the back of greaseproof paper by drawing round a coin or something circular. I suggest a £2 coin. (I made mini ones and bigger ones.) Put the paper on top of a baking sheet. Whisk the egg whites. Once they start to foam, add one tablespoon of sugar at a time. 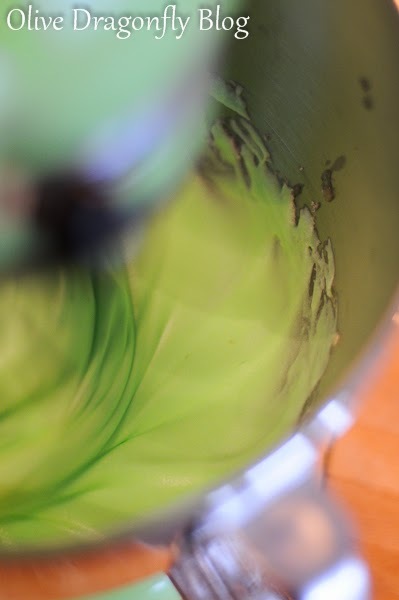 Continue whisking until the mixture is stiff. If adding colour, do it after the sugar has been added. Sieve the icing sugar and ground almonds into a bowl. This could take a while as the almonds are rarely fine enough! You need elbow grease to push it through the sieve. 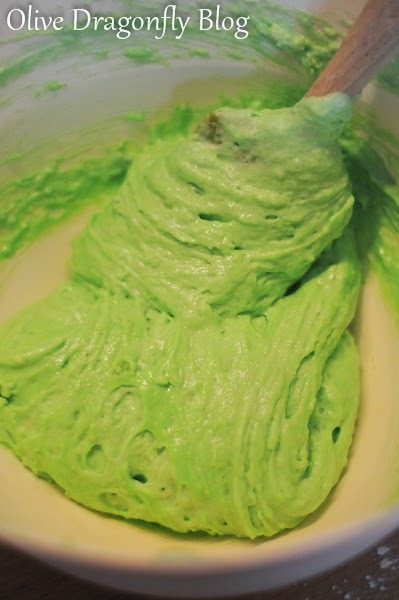 Fold the dry mix into the egg whites gently. 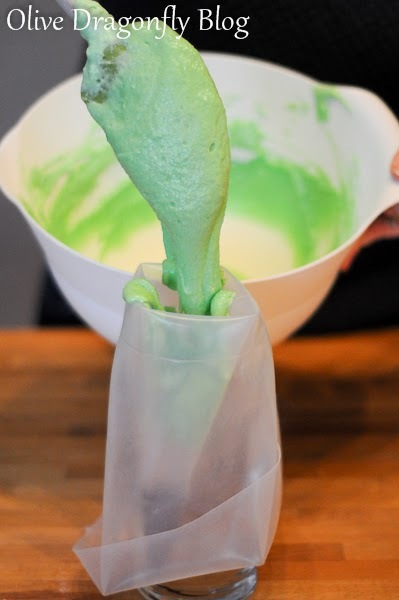 Put the mix into a piping bag with a round tip and pipe onto the template. 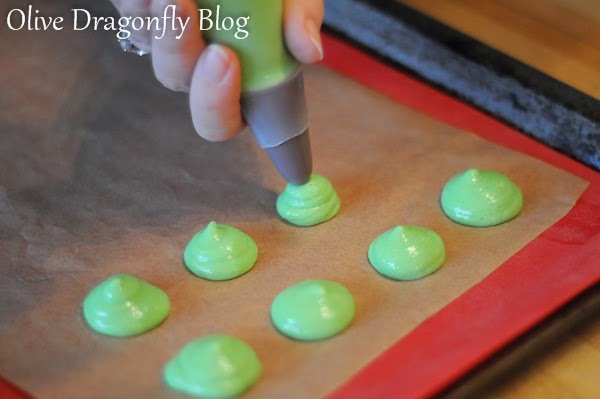 Once done, bang the baking tray on the worktop a few times to release any air bubbles. 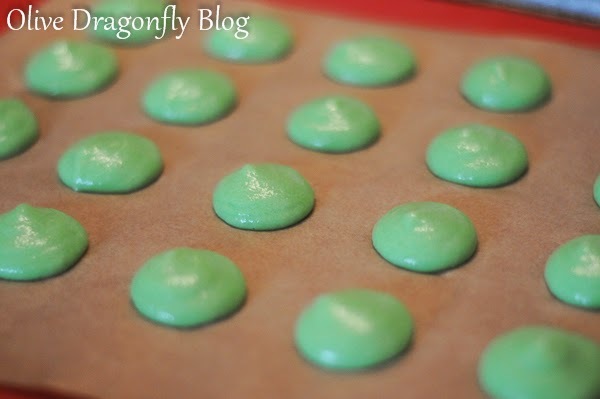 Set aside the macarons for an hour to develop a skin on top. Remove from the oven and cool. They should have a dimply "foot" and a smooth surface on top. Pretty chuffed with those feet! Varied success in peeling them off - loved the sticky middles though! 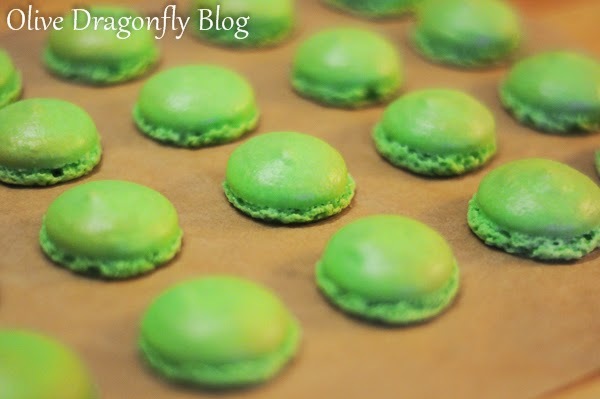 If the macarons are slightly uneven in size, pair up similar sized ones ready for filling. 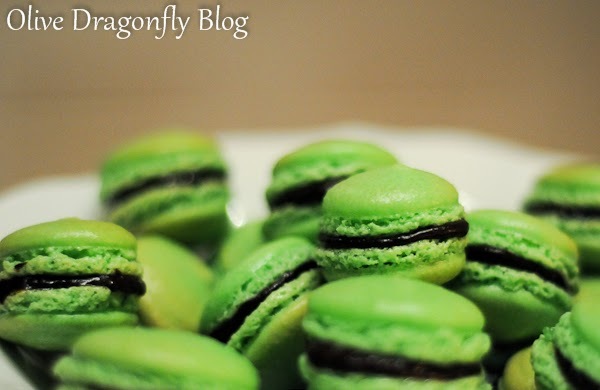 The most common filling for a macaron is a simple chocolate ganache. 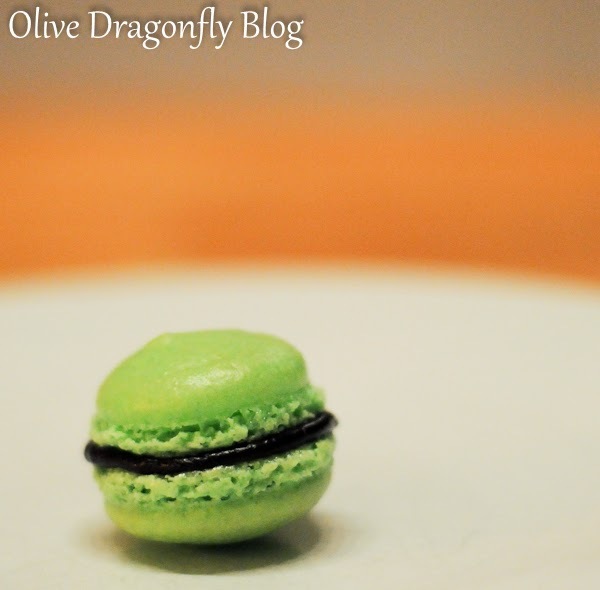 Simply dollop a little bit of filling on the bottom macaron and gently sandwich them together. 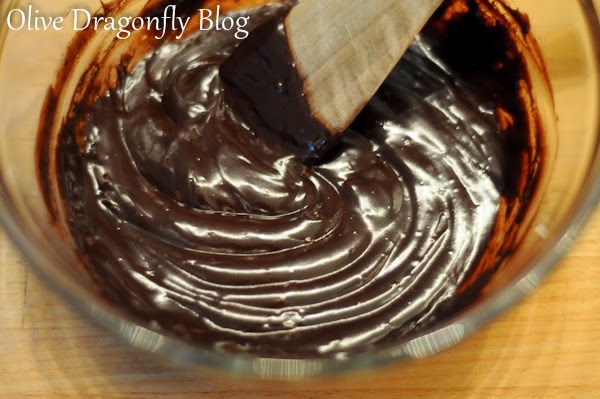 Break up the chocolate in a heatproof bowl. Bring the cream to the boil, then let it cool for one minute. Pour over the cream and stir until smooth. 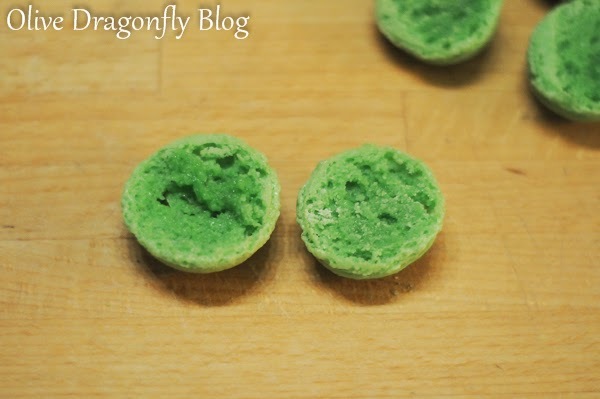 Cool and then use to sandwich the macarons. Ok, first of all, this isn't a quick bake. 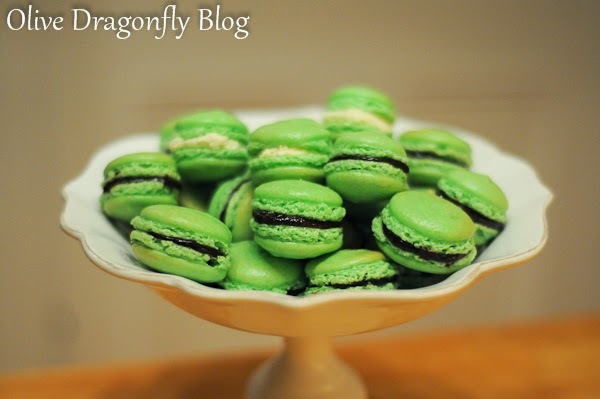 You need to rest the macarons so it's not something that can be whipped up quickly. The aging of the egg whites IS important. 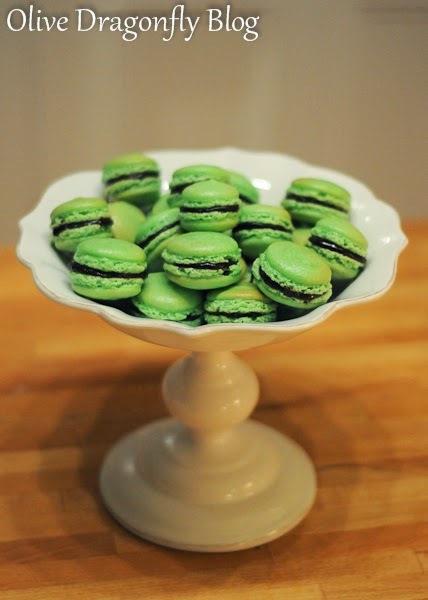 My one disastrous batch of macarons were made with non-aged egg whites. I use liquid egg whites (Two Chicks, normally in the ready made pastry section of a supermarket) and leave them out at room temperature for at least 3-4 hours. If I was using actual egg whites, I'd age them for at least 12 hours but the longer the better. If you are adding colour, use powder or gel. It's best not to add any more liquid to the mix. If you find the macarons go brown easily while cooking, prop open the oven door with a wooden spoon. I only ever make one baking tray load at a time, in the centre of my oven. I've found that it's hard to bake them evenly otherwise. Make a template to help pipe the circles. 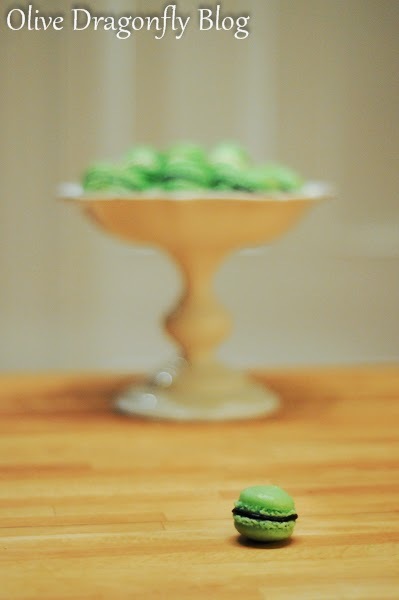 For mini-macarons like my pink ones, I used a 10p coin. For normal sized ones, a £2 coin is about right! It's really important not to over mix the egg whites and dry ingredients. One way to test it is to drop a small dollop of the mix onto a plate. If it smooths out, then the mix is ready. If it looks grainy and rough, it needs a little more mixing. I ran out of ganache for the last few so I whipped up some double cream with a tiny bit of icing sugar and some apple sauce! I actually preferred these ones but my chocoholic husband adored the chocolate ones of course!